Feel like you're losing the ever-challenging battle against the visible signs of age? 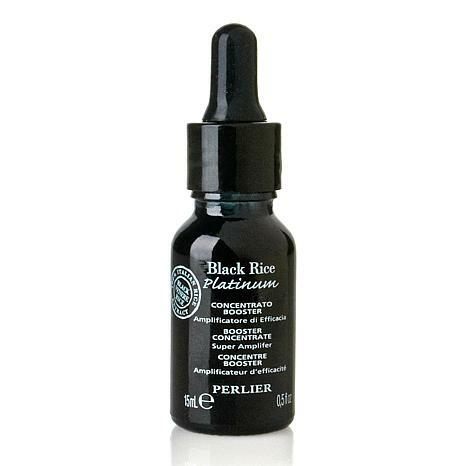 Let Perlier help with the skin-sational benefits of this black rice boosting face serum. It's formulated to help you enjoy a younger, more vibrant look. What's not to love about that? Ingredients: AQUA (WATER), GLYCERIN, INULIN, LACTOBACILLUS/PUNICA GRANATUM FRUIT FERMENT EXTRACT, PENTYLENE GLYCOL, ORYZA SATIVA EXTRACT (ORYZA SATIVA (RICE) EXTRACT), OLEA EUROPAEA LEAF EXTRACT (OLEA EUROPAEA (OLIVE) LEAF EXTRACT), EUTERPA OLERACEA FRUIT EXTRACT, HYDROLYZED RICE PROTEIN, SODIUM HYALURONATE, HYDROLYZED SOY FLOUR, BIOSACCHARIDE GUM-1, PYRUS MALUS EXTRACT (PYRUS MALUS (APPLE) FRUIT EXTRACT), SODIUM POLYACRYLATE, DIMETHICONE, CYCLOPENTASILOXANE, XANTHAN GUM, PEG/PPG-18/18 DIMETHICONE,TRIDECETH-6, IMIDAZOLIDINYL UREA, TETRASODIUM EDTA, METHYLCHLOROISOTHIAZOLINONE, METHYLISOTHIAZOLINONE. 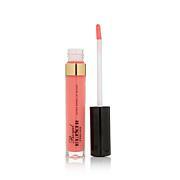 I love this product and have been using it for years! I also love all their hyaluronic acid time release products! This serum is soothing under my daily moisturizer. It helps my skin look younger and has brought back the glow to areas prone to wrinkles. Lightweight but powerful! It would be great to have a larger bottle. I don't want to run out of this product. This booster face serum has changed the look of my skin. I have used other products in the past but nothing works as well as this. My skin looks air-brushed after applying my foundation. So smooth. I get lots of compliments and I am 65 years old. Skincare doesn't stop at your face. Give your neck and décolleté the attention they deserve with this quick-absorbing serum. 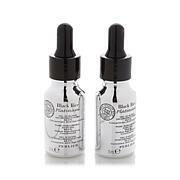 Incorporating caffeine, antioxidants and black rice proteins, the formula helps smooth and firm the skin's appearance. Let it put your look heads and shoulders above the rest.